MYRTLE BEACH,S.C. (AUGUST 7, 2014) - The reason behind Vice President & General Manager Andy Milovich's in-game prostate exam on July 24 came full circle this past Saturday with Coaches vs. Cancer Night. Milovich agreed to the exam if the team could raise Fierce Fallon's Facebook Page to 10,000 'Likes'. Saturday night acted as a fundraiser for Fierce Fallon and featured a mini-football giveaway, a silent auction, a 50/50 raffle and more with all proceeds benefiting Fallon. All-in-all the night raised over $6,500. The highlight of the night however, came before the anthem was even sung. Fallon made her grand entrance to the ballpark with family and friends in the back of a pick-up truck as her favorite song, Katy Perry's Roar, boomed throughout the stadium. Once arriving to the home dugout she made her way to the pitcher's mound for a ceremonial first pitch. Moments later, after player introductions, Pelicans starter Chad Bell took his place on the mound and prepared to face the first hitter of the night, Fierce Fallon. One pitch from Bell was all it took as her baseball debut went down in the books as a solo home run and one of the most memorable knocks at TicketReturn.Com Field. She took her victory lap around the bases to a standing ovation and roaring crowd. A video of Fallon's first pitch and home run can be seen on the Pelicans' YouTube Channel. "She is such a fighter and has inspired so many people over the past ten months," stated Milovich. "The fact that we had the opportunity to not only help raise money but provide her with a memorable night is very special to me and our entire staff." The Saturday night post on Fallon's page included a video of her home run with the comment, "Fallon had the most amaz-wing time tonight at the Myrtle Beach Pelicans game. Here she is hitting a HOME RUN at her first ever at bat! Thank you to everyone that made this possible!!!" Fallon also told her mother that "It was the best day of my life." Saturday was only the start of the Pelicans' charitable efforts this past weekend. Sunday was Pink in the Park with a focus on breast cancer awareness. The night featured a mini-base giveaway with the words "Save 2nd Base" to the first 1,000 ladies. Additional highlights included a silent auction with pink bats and bases. All proceeds from the auction, 50/50 raffle sales and more benefited the Mary Kay Foundation. That number exceeded $4,000. 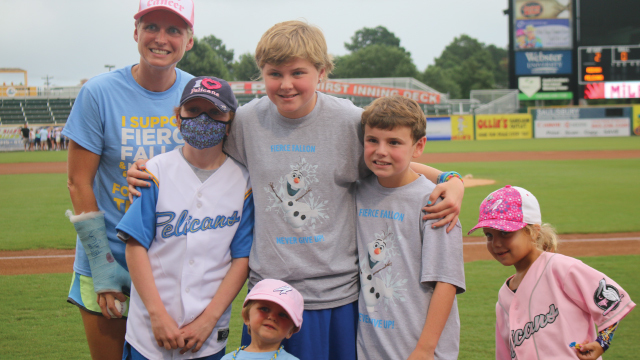 Sunday also marked the end of the Pelicans Strike Out Cancer Series. The series featured one night each month, April through August, and highlighted five different forms of cancer (esophageal, skin, testicular, prostate and breast). On each night the team dawned special jerseys which have been up for auction all season at myrtlbeachpelicans.com. The auction concludes next Friday, August 15th at 5:00 PM. The auction includes jerseys worn by Joey Gallo, Jorge Alfaro, Manager Joe Mikulik and more. For tickets to Pelicans home games please call (843) 918-6002, e-mail info@myrtlebeachpelicans.com, visit www.MyrtleBeachPelicans.com, or visit the Pelicans box office, which is open Monday through Friday from 10 a.m. to 5 p.m. and Saturday from 10 a.m. to 2 p.m.